Two guys with a penchant for funny voices and a sophisticated immaturity. 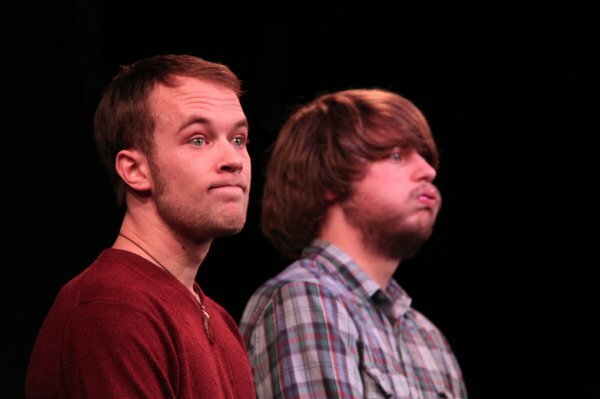 Travis Pelto and Joe Hingelberg, the two members of Forever Fifteen, met in high school at the campus improv club. After years of learning and performing together they won the Winter Colony Fest improv tournament at the Planet Ant Theater in Hamtramck, MI. The prize was their own show at the Planet Ant, which became “Joe vs The Travis”. After some more time and experience, the two became resident cast members at Go Comedy! Improv Theatre in Ferndale, MI, performing there regularly. In the Gauntlet, Go Comedy’s weekly audience voted improv battle, Forever Fifteen broke the previous record after winning (ironically) fifteen weeks in a row. Recently the two wrote and performed “Wirelessless” at Go Comedy, a two man show about a town with the worlds largest wi-fi zone days after it crashes.